If you’ve ever eaten a samosa at an Indian restaurant (or Whole Foods salad bar for that matter), you know those delectable little things are deep fried. 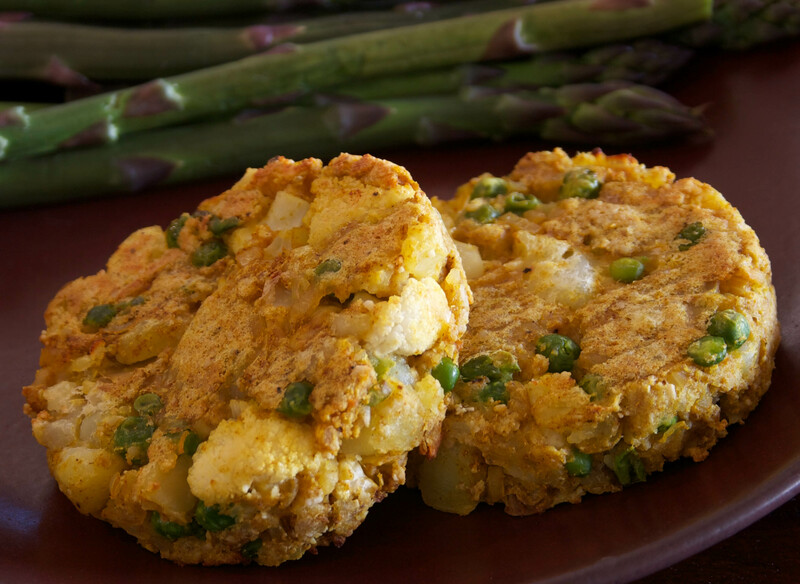 These patties have that mouth-watering samosa flavor, without all the fat and flour. This recipe is adapted from Rouxbe, the on-line plant-based culinary school I’m attending. The first time I made these I followed the recipe to the letter but felt they could be improved and made to be lower in fat. The family actually preferred my version. Score! Keep in mind the heat of these will depend on how much of and the type of curry powder you use. I’m a total wimp when it comes to spice so I only used 1 TBS curry powder (half Penzey Sweet Curry Powder and half Madras Curry Powder). Use more, or some cayenne, if you like the heat. They have tons of flavor regardless. Enjoy!! I needed something to eat for lunch and the red lentils in the pantry got my attention. I literally threw these ingredients together without a plan, and was SO happy with the result. It’s hard to believe something this easy could be so flavorful. 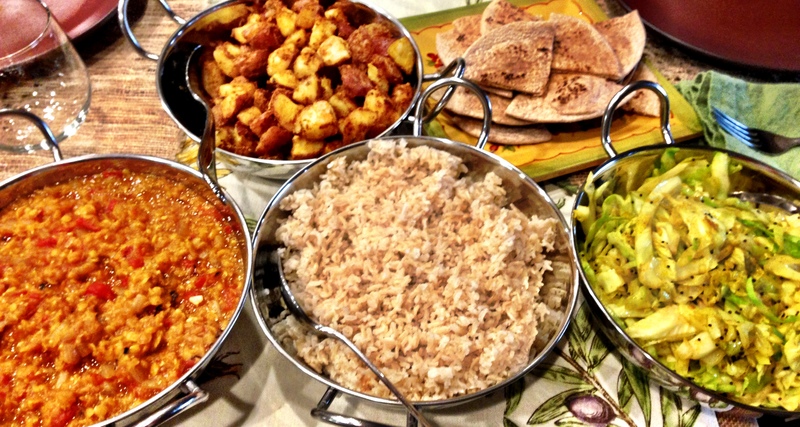 It was so good in fact that I included the dish in an Indian themed feast I cooked this past weekend. It was a big hit along with the Indian Spiced Cabbage, Roasted Aloo (potatoes), brown basmati rice and whole wheat flat bread. 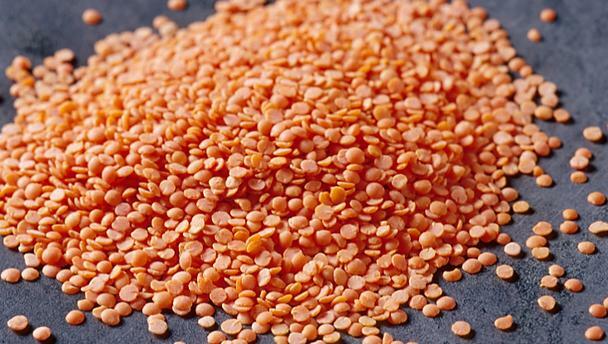 Red lentils are great because in addition to being extremely healthy and low-fat, they are quick-cooking. They can be used in sauces to add fiber and protein, or as the main ingredient along with a few others such as the recipe here. Unlike brown/green lentils they break down easily, blending in with whatever else is in the dish. They also end up being more yellow in color, even though they are called red and start out more of an orange color. At 140 calories per cup (dry), 0 grams of fat, 7 grams of fiber and 11 grams of protein, red lentils are a great addition to the diet. In this dish I used two different types of curry powder, but you don’t have to. Regular curry is the yellow/orange version you see in most stores. Different brands can taste different from each other, with some more mild than others. Madras curry is another type that is similar to regular but with more spice. Berbere curry is an Ethiopian version, that has a smokier scent/flavor and is much spicier than the others. Feel free to use whatever variety you have on hand, or a combination like I’ve done here. The measurements I used result in a mild dish. As I’ve said before, I’m a spice wimp.